Apologies if you are not a blogger or a writer, but since I know many of you are, I know you understand the struggle of coming up with consistent content. Not only consistent, but topics that are current and helpful to your readers. Inspiration is actually all around you—sometimes it just takes thinking outside the box to come up with original ideas. 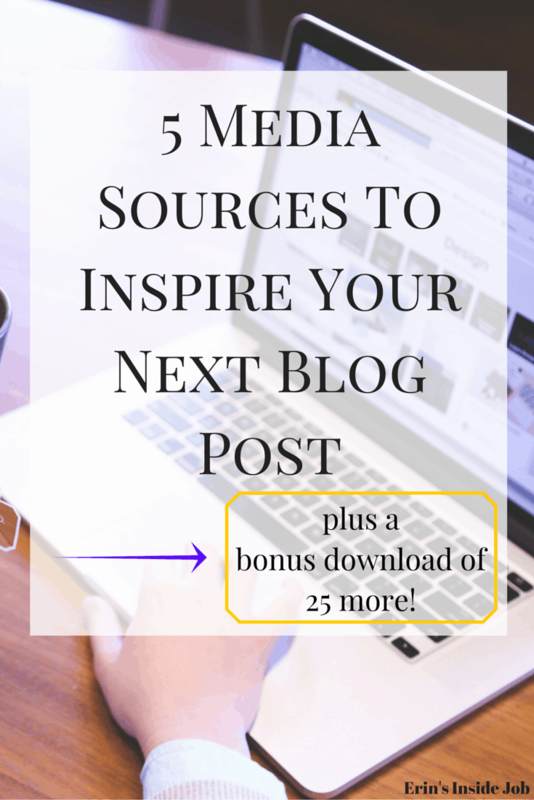 The next time you are searching for ideas, turn to these 5 media sources to inspire your next blog post! No matter what your niche, you can always count on the news to have something related to what you write about. In my case, I like to focus on anything related to health, fitness, or healthy living. Spend some time reading through news sites such as Yahoo News, The Huffington Post, CNN, New York Times, etc. for related subject matter. See what is currently headlining and think about related topics. You could either educate your readers by discussing the topic or write your opinion on it. Also try reading local news outlets to see if anything in your area is worth discussing. Have you read a great book about your blog topic recently? Many of my ideas come from reading books related to living a healthier and more productive life. It is often said that in order to write you need to read, and by doing so you will quickly find many options to write about. Sometimes even small quotes can be expanded into entire posts. Can’t narrow a book down to one post? Review the entire thing and discuss how it would benefit your readers. It’s true that there isn’t much original content anymore, especially in the online space. Read blogs that are similar to yours and take note of what they are writing about. DO NOT simply copy another writer’s post or idea verbatim, but think about ways that you could take an idea and create your own original spin on it. If that person’s post inspired you, make sure to take some time to give them credit in yours. I don’t know about you, but when I am bored I spend time on both Twitter and Facebook looking at what’s trending. If you’re on a mobile device, you can do so simply by hitting the search button and if you are on a computer, the trending topics are located on the left (Twitter) and right (Facebook) of the main feeds. Similarly to using news outlets as topic sources, trending topics can also serve as inspiration for your next post. Chances are if enough people are talking about something, a post on a similar subject should do fairly well. Twitter chats are virtual meetings were people get together at a specific time to weigh in on certain questions with their own experience or opinions. There are Twitter chats for virtually every subject and if you aren’t sure where/when the chats are, you can always search for your topic + chat within the search bar. There is a #DIYchat, #runchat, #addictionchat and many, many others to choose from. Some of my other favorites are #nectarchat and #ellechat. See what people are talking about and if there’s enough commonality for you to write a post solving a problem or answering a frequently asked question. The same can be said for Facebook groups. I belong to a number of groups for both fitness and creative entrepreneurship and there are always questions being posed about how to do something or crowdsourcing for information. Pay attention to what people are talking about and see if you can write about it! Stumped for #blog post ideas? Check out these 5 sources for inspiration! Check out the FREE bonus download of 25 more blog post ideas to get those wheels turning! Just sign up below and check your inbox for my 2-page PDF of topics. Happy writing! Sign up for your bonus PDF of 25 more blog post ideas! Loving these ideas, Erin! My secret inspiration source: magazines. I have a huge stack of them, and I’ll go back to ones that are six or nine months old and see if I can write a blog post about an idea they touch on briefly. It really does help with writer’s block! Oh yes magazines! I knew I forgot one. They’re another great resource for sure! Oddly enough I get great ideas reading other blogs or things that happen in my day to day life. I always worry u will run out of ideas then something pops into my head like magic. I always have my phone on me so that when I have those ideas randomly I can jot them down! Definitely. I always try and credit other bloggers and make sure that I’m not using the exact same idea. Thanks for reading Catherine! I’m always on the lookout for blogging inspiration. Oh yeah I’ve done that too! I always check out emails I get to see if they spark any ideas.